Iceland Tourism Blog offers a wide choice of experiences for the traveler, regardless of when you visit the country. Every season has its own unique charm and there are always opportunities to experience new things, discover beauty and be mesmerized by the freshness and colors of nature. Every season will leave you with a host of unforgettable memories. Spring is the time when the sun climbs ever higher, warming up the earth and all living things. The grass turns bright green and the migrant birds return, so it is the perfect time for bird watching. Over 200 species nest in Iceland, some of them in huge numbers. There are literally millions of puffins, and in many places you can get really close to them. In spring, anglers rejoice in the blue lakes and roaring rivers that abound with fish of superb freshness. The island dwellers celebrate the new life that is created in spring. In summer, the sky passes through various hues of blue, grey and azure, but you should never expect black tones – up here in the north the sun hardly sets and the summer days are never-ending. Smell the growing green grass or marvel at the small but sturdy flowers of the lowlands. Or visit the highlands and experience the vastness, pureness and wondrous views of this uninhabited area. Discover how the blue sky, the brown earth and the white ice all meet on the horizon. 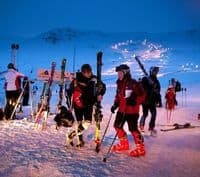 Summer also offers a great choice of activities, such as diving, glacier-skiing, skidoo excursions on Europe’s largest glacier, trips on quad bikes, angling, and mountain biking or kayaking. And don’t forget to go on a boat safari to spot some of the magnificent whales that thrive in the rich oceans around Iceland. In autumn, brooks and rivers, swollen with melt water, rush down to the lowlands, feeding the earth and ultimately the ocean. Nature’s produce is welcomed everywhere. Green vegetation turns red, yellow or brown, resulting in picturesquely colorful landscapes. No wonder photographers find autumn an exciting time, with all its different shades and magnificent skyscapes. In autumn, sheep and horses that have been grazing in the mountains are driven back to inhabited areas and sorted in the yearly round-ups. These are lively and social occasions, in which visitors are welcome to participate. Follow this link to find Farmhouse Accommodation. Winter is the time of amazing contrasts. Peaceful white snow accentuates the black lava fields, resulting in magical artistry. In the evening the blackness of the sky may be suddenly disturbed by dancing, flickering veils of light, in green, white or red, for the northern lights are often visible in cold, clear weather. You could well imagine that the snowstorms and winds that sometimes sweep over the country are vying for some great prize, but they always lose their battle: after a while everything returns to stillness and tranquillity, and the land is pristine, as if just reborn. Winter is a great time for cross-country skiing and you don’t need to go far from Reykjavík to find yourself surrounded by scenic landscapes and tremendous views. Even though each season has its own charm and character, many activities can be enjoyed all year around: horse-trekking, participating in a wide range of sightseeing tours, visiting museums – of which there are many – sampling the comforts of the city, eating wonderful food, shopping or enjoying one of the many cultural festivals that are held in Iceland.